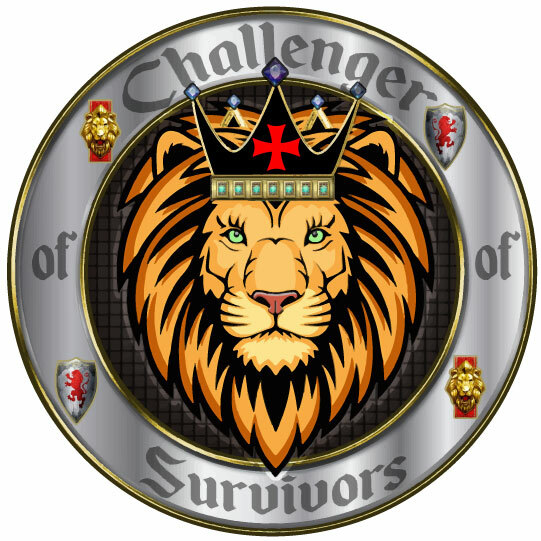 Challenge of Survivors "Earn Free Lion Knight Templar Medal"
The story of The Lion-Knight Templar. Leoncio XI was a liege who was caught in a witch’s spell. The witch turned him into half-man half-lion while he was protecting the Excalibur sword. Leoncio XI was a member of the brotherhood of the Knights Templar, he was also a land conqueror and he fought against Muslims during the Holy War. As he returned to Britain, after fighting bravely in the Holy War, he found out that King Arthur was dead. Hence, the Excalibur sword was in danger, since the Witch of the Mountains wanted to own it. Leon decided to get back the sword, and he knew that the Lady of the Lake’s life, the one who protected the Excalibur sword, was in danger too. The Lady of the Lake saved the Excalibur from the witch’s mighty powers. Leon tried to get the sword back to a safer place but the Witch of the Mountains caught a spell on him and turned him into a lion. Merlin, the wizard, tried to break the spell but he couldn’t make it successfully: The witch’s powers were too strong. Hence, Leon was half-man, half-lion for the rest of his life. However, The Excalibur was returned to the Lady of the Lake for eternity and beyond. Who: All people all ages walkers are welcome. You just have to complete 6 out of 12 of the competitions already mentioned. You can join the race by signing up individually, according to the virtual races schedule. You can also sign up by only $99, 99. This way you can get 8 medals, (6 of them are mandatory!) an extra medal and the Emperor’s Lion Leoncio XI medal. You will be informed via e-mail about the shipping of the medals to your current postal address. Remember, it is a virtual race. You can participate from anywhere according to your schedule. The race distances you can choose are: 10K/ 5K/ 1K or Half Marathon or any distance where you like. Bib number: emailed 3 business days after registration. Feel Free to unloading your photos and share your race experiences. No accept claims, not money back after registration.